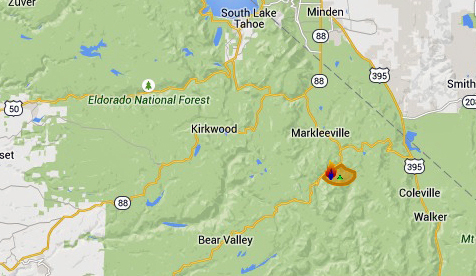 A wildfire 8-10 miles south of Markleeville continues to grow. The blaze, known as the “Washington Fire”, was sparked by lightning on Friday, June 19. High winds and heavy timber created a rapid rate of spread over the weekend. The blaze is currently 10% contained. Hwy. 89 over Monitor Pass is closed at Hwy. 395 and Hwy. 4 is closed as well. The blaze is spreading northwest towards Markleeville. Several campgrounds along Hwy. 4 to the north end of Markleeville have been evacuated. Residents of Markleeville are being advised to get ready for mandatory evacuations. Steep rocky terrain, lack of vehicle access, and high winds are hampering firefighting progress. There are currently 500 personnel, 10 air tankers, 8 helicopters, and 17 engines working the fire. Possible thunder storms later in the week could hamper containment efforts.